Every month, we’ll be introducing our readers to our team. Linking Arts has a team of talented developers, graphic designers, user experience designers and more. But, we want to share some interesting things about our team members. 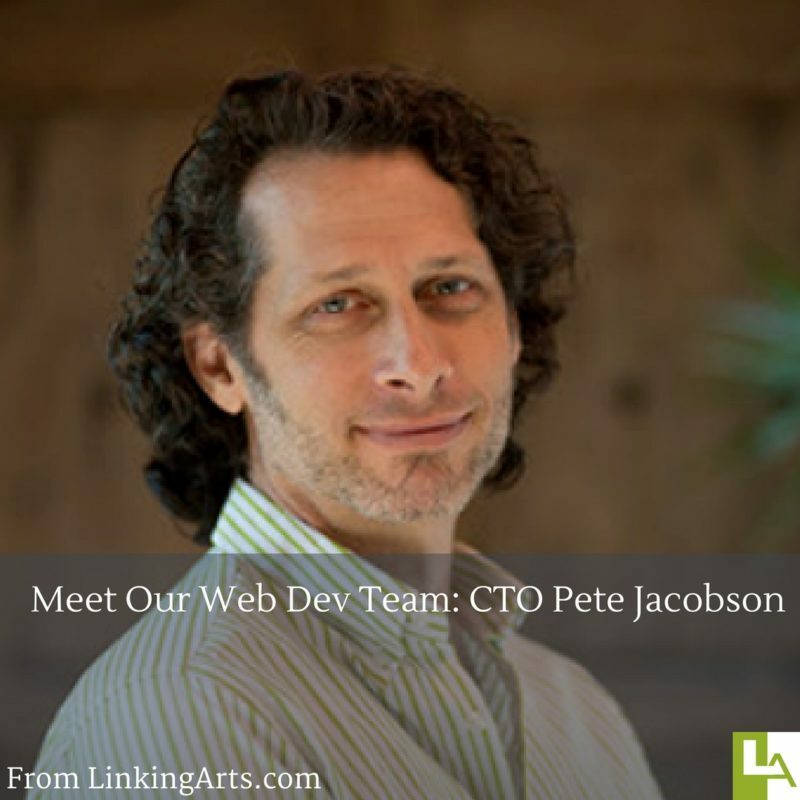 Today on our blog we’re talking with Pete Jacobson, web developer, founder and former chef. How many years have you worked in tech? That’s a tough one. Aside from being everybody’s go-to tech support for basically my entire life, I’ve been working on the WWW since about 1995. What most excites you about the work you do? What interests me most is helping people shape their ideas and businesses. The tech is a means to an end (and tech is not always the answer). It’s rewarding to see your work make it possible (or simply easier) for someone to succeed and achieve their goals. What’s been the biggest lesson you’ve learned in your work as a web developer? Always really listen to what your clients are saying, and pay attention to what they really are asking for. Don’t get caught up in what YOU want to do. If you do what you feel like doing without paying proper attention, you will regret it. And your client will not be happy. Tell us something unique about yourself that most people wouldn’t guess about you? I was a professional chef for many years before the Web existed, and have done just about every job you can imagine, including working at a traveling carnival. Not even joking! What makes your approach to tech unique? Are there certain perspectives that you apply to your work? I’m a generalist – I like to know about and look at everything, not just the task at hand. I like to place things in the larger context to get a clearer idea of the true goals a person or company has or have, and to always be clear about the task and scope boundaries. That’s why we offer so many services, and also why we don’t generally take on projects that are limited to solving a single, super-technical problem. Everything is connected, and we don’t like to leave a client with something half-baked. SEO, UX, graphic design, features and functionality, marketing, high code quality and thorough bug testing all are part of setting up a client to succeed. Pete founded Linking Arts around 2004 and co-founded wedocracy.com in 2012 with his partner and wife, Uchechi Kalu Jacobson. He's done a little of everything, from digging ditches, to cooking, to film, to tech and quite a few things in between. He's been building for the WWW since 1995.